Why Does Your Nose Run When It's Cold Outside? Your nose: one minute it’s a passageway for pleasant scents and life-giving oxygen, and the next it’s nothing more than an inconvenient snot faucet. This is especially apparent during the winter months. If you’ve ever experienced mucus running from your nose in sub-freezing temperatures, than you’re familiar with cold-induced rhinorrhea. Rhinorrhea is the fancy medical term for a runny nose, and it can be caused by several different factors. 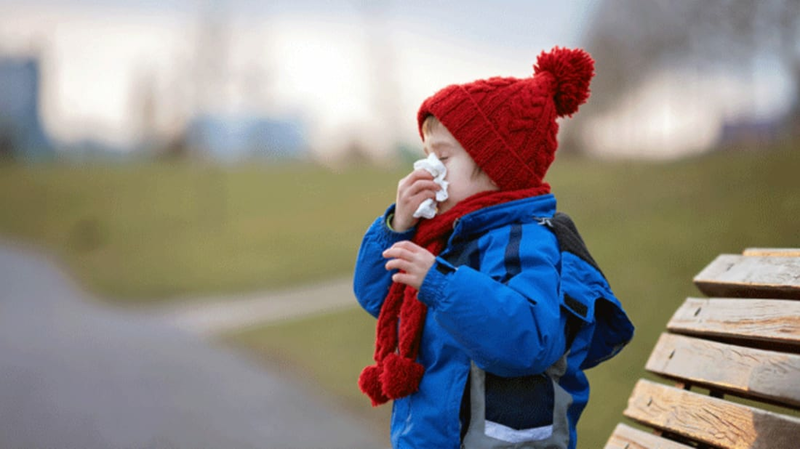 In the case of cold-weather snot, there are two major culprits to blame: biology and physics. On the bodily side of things, your nose works overtime when it’s cold outside to make sure the air you inhale is suitable for your sensitive lung tissue. Air that’s cold also tends to be very dry, so in order to humidify it, the nose ups its fluid production. This often leads to excess mucus, which ends up on your face instead of inside your nostrils. The second factor can be explained by thermodynamics. A small part of every breath we exhale is water vapor. This can be observed firsthand in frigid temperatures: When the warm air from our bodies is expelled into the cold it condenses into a cloud of tiny droplets, allowing us to “see” our breath. This same principle is partly responsible for your runny nose. When the warm air inside your nostrils confronts cold temperatures, the moisture comes together to form larger, heavy droplets that contribute to the mucusy mess. People who exercise in the cold are especially susceptible to a runny nose triggered by those low temperatures. The condition even has a name—"skier’s nose" (which admittedly sounds much sexier than “snot-covered face syndrome”). To learn more about unusual nasal behaviors, check out our Big Question about why your nose gets stuffy one nostril at a time.